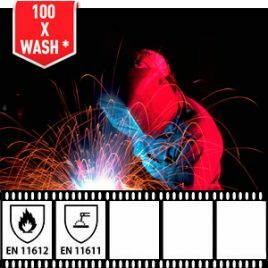 Gefest flame retardant protective fabric is purposed for professional welders clothing in different areas such as Machinery, Metallurgy, Oil and Gas Pipeline construction, Automotive etc. Satin weave of Gefest is extremely useful in protective overalls, bibs or aprons of welders and other workers letting molten metal drops go off easily from the smooth surface of the fabric. Made of natural fibers it is comfort to wear and at the same time Gefest protects from risks of Flash Fire and Electric Arc. With an excellent ATPV parameter (20 cal/cm2), Gefest may reach the requirements of HRC level 3 (25 cal/cm2) with the use of additional flame retardant underwear. Gefest-480 is a heavy weight 480gsm pure cotton protective fabric with flame retardant finishing. Smooth Satin 5/2 weave. 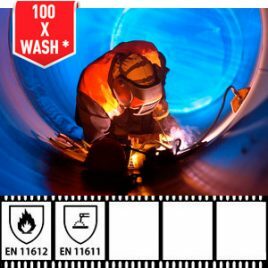 Flame retardant fabric Gefest was designed especially for welders working in extreme conditions of open sea oil-platforms, in dry docks and in naval shipyards. Gefest is extremely durable fabric due to innovative composition of long staple cotton fibers, which are twisted in warp and weft. The fabric is so durable that it's impossible to tear it with your hands. This gives you significantly increased life circle of welders clothing made of Gefest protective fabric. 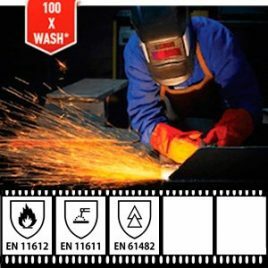 Gefest-480 flame retardant protective fabric is purposed for professional welders clothing in different areas such as Machinery, Metallurgy, Oil and Gas Pipeline construction, Automotive etc. Satin weave of Gefest-480 is extremely useful in protective overalls, bibs or aprons of welders letting molten metal drops go off easily from the smooth surface of the fabric. Made of natural fibers it is very soft and comfortable to wear and at the same time the fabric protects from the risks of Flash Fire and Electric Arc. Madeira-260 is a flame-retardant 100% cotton fabric with 260 gsm density, with a classic twill 3/1 weave. Madeira-260 is a pure cotton flame-retardant protective fabric made of a long-staple pure cotton. It can be used for middleweight welders clothing as well as for different metal processing works in heavy machinery, automotive manufacturing, etc. Made of 100% natural fiber, it is comfortable to wear and at the same time, Madeira-260 safely protects from the risks of flash fire. This fabric can be used for everyday flame-retardant workwear such as FR-pants, FR-jackets, FR-bibs, and FR-overalls. Madeira-320 AS is a flame-retardant cotton fabric with antistatic yarn with 320 gsm density, with a classic twill 3/1 weave. Madeira-320AS is an Antistatic version of our best-selling Madeira-320 pure cotton flame-retardant fabric. Madeira-320AS is a protective fabric made with antistatic yarn (1%) and cotton (99%). It can be used for welders clothing as well as for different metal processing works in heavy machinery, automotive manufacturing, etc. Made of natural fibre, it is comfortable to wear and at the same time Madeira-320 safely protects from the risks of flash fire and electric arc. 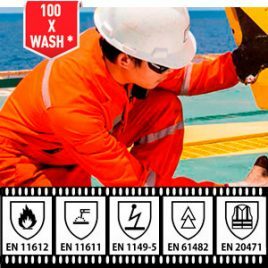 Madeira-320AS FR-fabric is certified to EN 1149 Antistatic standard. 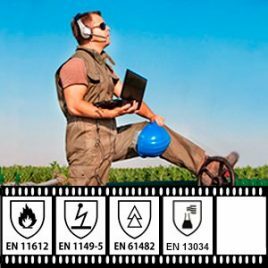 This prevents accumulating ESD charges and make it safer to use this fabric for everyday flame-retardant workwear such as FR-pants, FR-jackets, FR-bibs, and FR-overalls. XM FireLine Flame Retardant fabric collection consists of protective fabrics made of 100% cotton with flame retardant finishing. These protective fabrics are most used in such industries as Automotive, Petrochemical, Power energetics and other industries. Made of natural fibers they are soft and comfortable to wear, have good perspiration and absorption properties. Natural, Comfortable and Ecological– our flame retardant cotton has all comfort of natural fibers, yet treated with special chemical process it becomes flame retardant. 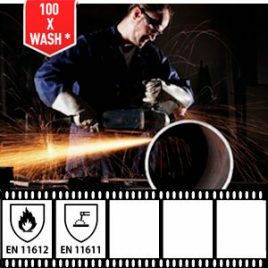 XM FireLine FR – cotton is OEKO-TEX 100 certified ensuring no harm to the wearers. Internationally Certified – our flame retardant cotton fabrics have been certified to comply with the main European and American standards in world’s leading laboratories such as BTTG (UK), Kineсtrics (Canada), Vartest (USA), AITEX (Spain), UL (USA). All certificates are available to download from our website. Proven Protection – ISO 11612/11611, EN 61482, ASTM 1959, NFPA 2112 – standards that our flame retardant cotton fabrics comply with. FR-treatment that stands 100x washing – our flame retardant cotton fabrics keep flame resistant properties after 100 and more washings. This has been approved by a well- recognised Underwriters Laboratory (UL). Economically efficient – Protective clothes made from our XM FireLine flame retardant cotton offer you a good protection for a very reasonable price. Flame retardant cotton garments are very popular and best selling in the world. These flame retardant garments provide a necessary level of protection in almost all industries and keep flame resistant properties after 100 and more washings. That means flame retardant cotton clothes keep its protective features during the whole life of an item. To provide a proper protection level please follow care instructions.